Elder brother murders younger, dumb brother ... to grab ancestral house! 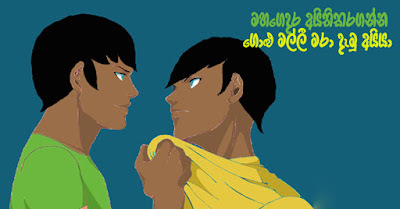 A person suspected of having struck his dumb brother with a club on the head with the motive of grabbing the ancestral home which was to be inherited by another person by generation was taken into custody at Morapitiya in Badureliya police area by Kalutara Law Enforcement Division on the 1st of this month. with his wife and baby in the ancestral home and has no stable job as such. During a certain day last week he had died as a result of a blow dealt on the head and on instructions of deputy inspector of police in charge of Kalutara division Mr. Ranmal Kodituwakku, superintendent of police in charge of Kalutara division, Mr. Upul Nilmini Ariyaratna and assistant superintendent of police of Kalutara, Mr. Kapila Premadasa and on an inspection conducted by officers of law enforcement unit of Kalutara division, clothing worn at the time of the deceased sustained the fatal blow was found at a 'waadiya' in Piliyandala where the suspect brother was staying. Investigations conducted across this data, the suspect was arrested last 1st in Morapitiya in Badureliya police division. Police suspect that this death was the result of an issue linked to property and it was further revealed that another elder brother in the same family was missing sometime back, as revealed in police investigations. The suspect taken into custody is expected to be produced before court and is to be handed over to Kalutara South police.